Stampede Filtered Cigars have been assembled with a select and secret blending of toasted Kentucky tobacco leaves producing a distinctive taste with a smooth finish and pleasant fragrance. These discount filtered cigars are also preferred by seasoned smokers all over the world for their rich flavor. Apart from high-end Kentucky Burley cigar tobaccos, Stampede Filtered Cigars also boast premium homogenized wrappers that deliver an even-flavored taste and a pleasantly unique aroma. Having a good quality wrapper means you’ll rarely have to deal with burn issues. Additionally, these premium filtered cigars include a slightly longer filter that provide a balanced draw, without all the stray flakes and extra heat. Stampede Filtered Cigars are distributed nationwide by Xcaliber International located at One Tobacco Road, Pryor, OK USA. Each of these discount filtered cigars are available at our online tobacco store in unique styles to choose from. Full Flavor, Smooth, Menthol, Vanilla, Strawberry and Cherry. Our online filtered cigar store offers great deals and inexpensive ways to save money on over-prices retail brands. 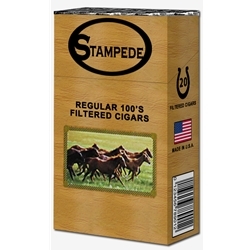 Stampede Filtered Cigars is an excellent choice for your smoking needs. Our online cigar store was created to make it easy and affordable to buy filtered cigars online. Call us for more details!